Skype conference with 60 high school students and Simone Liebster. Skype conference with 31 high school students and Simone Liebster. Skype conference with elementary, middle school, and high school students and Simone Liebster. Skype conference with 51 9th grade students and Simone Liebster. Skype conference with 42 9th grade students and Simone Liebster. Skype conference with 7th and 8th grade students and Simone Liebster. Skype conference with 21 students and Simone Liebster. 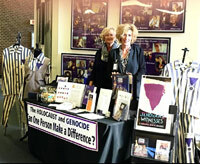 The Fall Holocaust Institute was held at St. Ambrose University with the theme "One Person Can Make a Difference." Exhibitors Greg and Sandra Milakovich provided general information and curriculum resources for educators, students and community members in attendance from Iowa and Illinois. Social studies teachers gathered at A.C. Reynolds High School for a content professional development day. 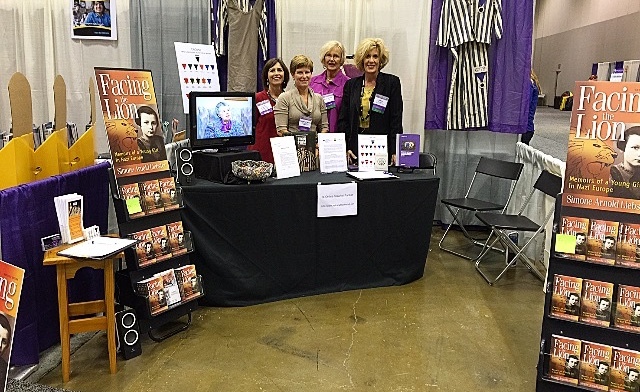 Exhibitor Diana Zientek shared curriculum resources and information about classroom presentations and a live interview with Simone Arnold Liebster. Held at Cesar Chavez High School, the conference theme was "Social Responsibility: Teaching Global Awareness and Citizenship." 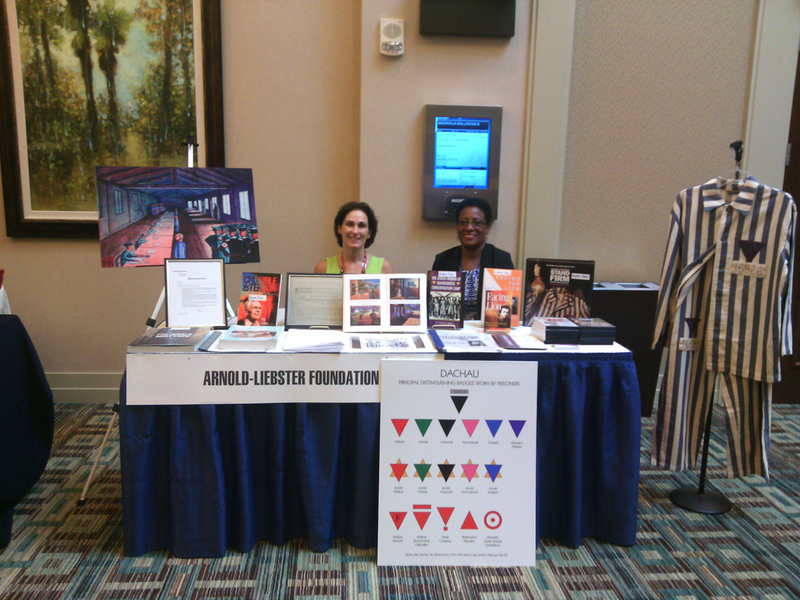 Exhibitors Kristin Dickman Walter and Stephanie Weibel shared curriculum materials from the Arnold-Liebster Foundation website. Arizona Council for the Social Studies includes the Arnold-Liebster Foundation on its Websites of A.C.S.S. Affiliated Organizations & Classroom Resources for teachers and social studies specialists. Skype conference with elementary, middle, and high school Spanish students and Simone Liebster. Harper College hosted the Fall 2015 Conference. Marge Fulton and Gaye Flowers facilitated a teacher workshop "Standing Up and Standing Firm in Nazi Europe" with a Skype interview of Simone Liebster. 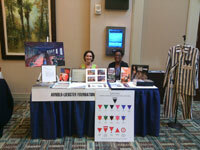 An exhibit table provided further information and classroom resources. The fall Holocaust Educators Conference was held at the Center for Diversity Education at University of North Carolina Asheville. Diana Zientek shared curriculum resources, including an online teacher packet and the documentary video Jehovah's Witnesses Stand Firm Against Nazi Assault. 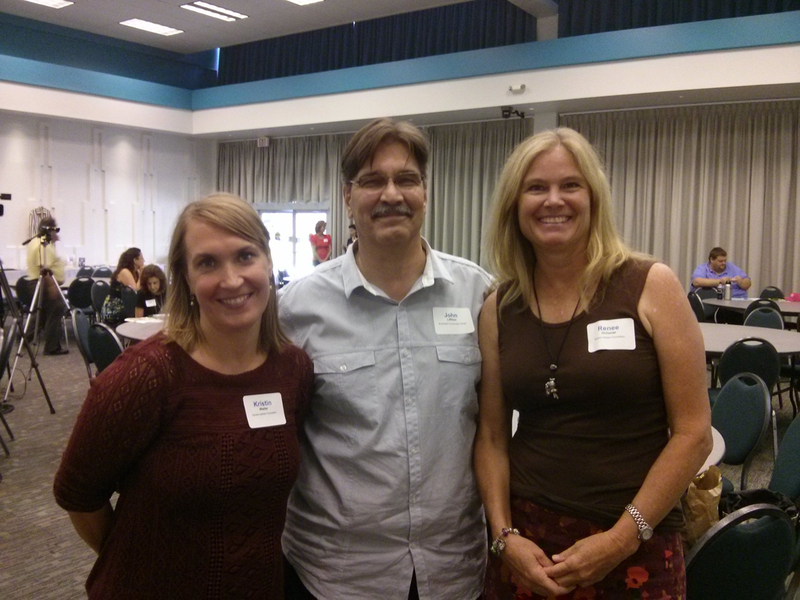 The Arnold-Liebster Foundation was invited to participate in the fall learnshop, Integrating Holocaust and Genocide Studies into the Curriculum, presented by the Maricopa Center for Learning and Instruction. 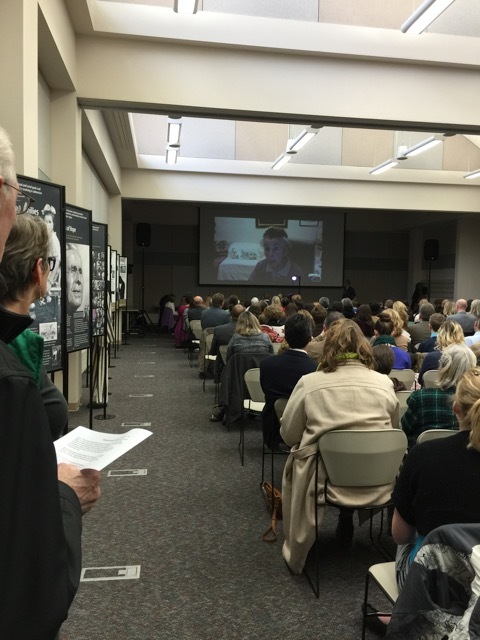 Renee Ochsner and Kristin Dickman Walter's workshop, "Stand Firm: The Conscientious Resistance of Jehovah's Witnesses in Nazi Era," featured a Skype interview of Simone Liebster. An exhibit table provided curriculum resources and historical information. The learnshop was held at Scottsdale Community College, the only public community college in the nation to reside on Native American land. The 58th Annual Conference of Florida Council for the Studies was held in Orlando and highlighted the theme, Focus on Florida: Learning from the Past . . .Teaching for the Future. 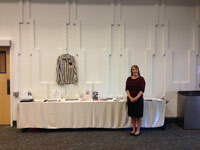 Exhibitor Carol Confehr provided information and curriculum materials from the Arnold-Liebster Foundation website. The Florida Department of Education Task Force on Holocaust Education includes the Arnold-Liebster Foundation on its Classroom Resources page under Resource Links. Thousands of literacy advocates, educators, and researchers gathered for the Annual 48th Illinois Reading Council Conference, Passport to Possibilities, at the Peoria Civic Center. Marge Fulton and Gaye Flowers conducted a workshop, "Standing Up, Speaking Out, Standing Firm — Facing the Lion in Nazi Europe", with a Skype interview of Simone Arnold Liebster, author of Facing the Lion: Memoirs of a Young Girl in Nazi Europe. 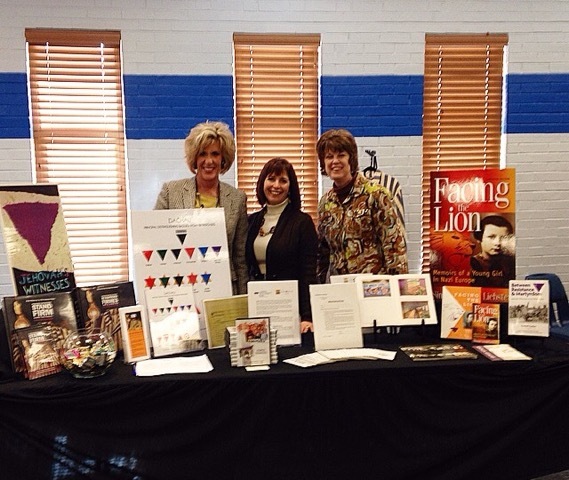 An exhibit table provided information and curriculum resources related to Ms. Liebster and her book. Skype conference with 170 8th grade students and Simone Liebster. Skype conference with middle and high school foreign exchange students and Simone Liebster. The students were from China, South Korea, Brazil, and Mexico. 14th Annual Martin & Doris Rosen Summer Symposium on Remembering the Holocaust. Contributed to the Symposium by providing online teacher packets and curriculum resources. Diana Zientek presented information about the Nazi persecution of Jehovah’s Witnesses, including a dramatic reading from “Facing the Lion: Memoirs of a Young Girl in Nazi Europe” by Simone Arnold Liebster. Skype conference with 120 10th grade students and Simone Liebster. Skype conference with 60 10th grade students and Simone Liebster. Skype conference with high school students and Simone Liebster. Skype conference with 58 6th grade students and Simone Liebster. Two Skype conferences with 360 6th grade students and Simone Liebster. 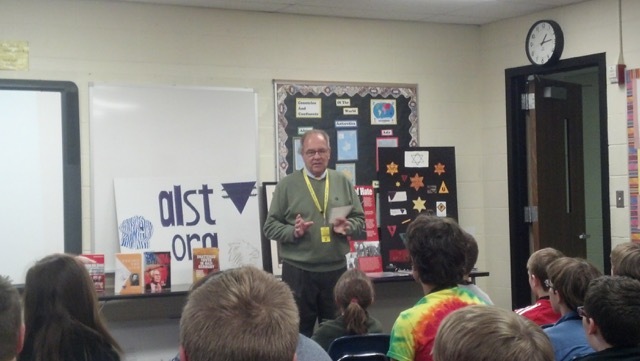 Bill Keller (pictured) and Kristi Keller presented information about the Nazi persecution of Jehovah's Witnesses prior to the students' Skype conference with Simone Liebster. Students asked Simone Liebster questions during the Skype conference. The Human Library was held as part of Genocide Awareness week. As a Best Seller Human Book, Simone Liebster shared her experiences related to prejudice and discrimination during the Holocaust. Human Readers asked questions with the goal of promoting dialogue, reducing prejudices, and encouraging understanding and learning. Two Skype conferences with 125 8th grade students and Simone Liebster. 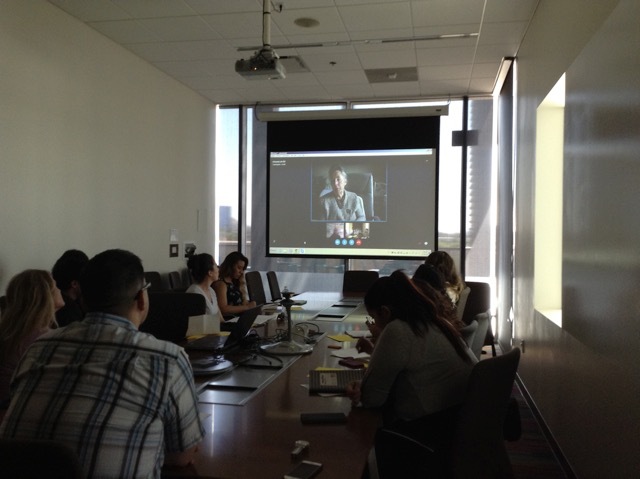 Skype conference with 20 college students and Simone Liebster. Skype conference with 200 5th grade students and Simone Liebster. 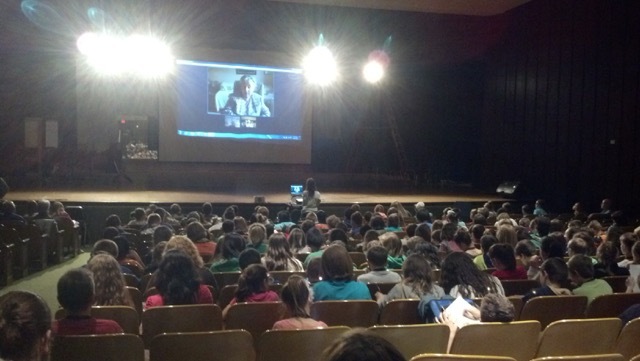 Skype conference with 60 7th grade students and Simone Liebster. Skype conference with 70 4th grade students and Simone Liebster. Skype conference with 50 students and Simone Liebster. Skype conference with 51 students and Simone Liebster. Two Skype conferences with 200 8th grade students and Simone Liebster. Skype conference with 50 9th-12th grade students. The Spring Conference was held at Eastern Illinois University. Gaye Flowers presented a teacher workshop with the theme "Holocaust: Contrasting Choices/Contrasting Consequences-Then and Now" that included a Skype interview with Simone Liebster in France. An exhibit table provided further information and curriculum materials. The 2014-2015 conference was held at Robert Morgan Educational Center. Carol Confehr presented a teacher workshop highlighted by a Skype interview with Simone Liebster in France. 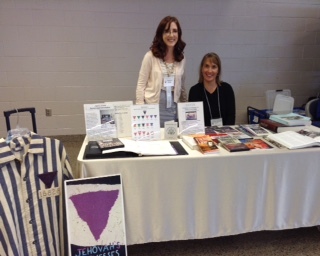 An exhibit table featured curriculum materials related to the Nazi persecution of Jehovah's Witnesses. Two Skype conferences with 9th grade students and Simone Liebster. Skype conference with 40 11th grade students and Simone Liebster. Skype conference with 50 11th grade students and Simone Liebster. 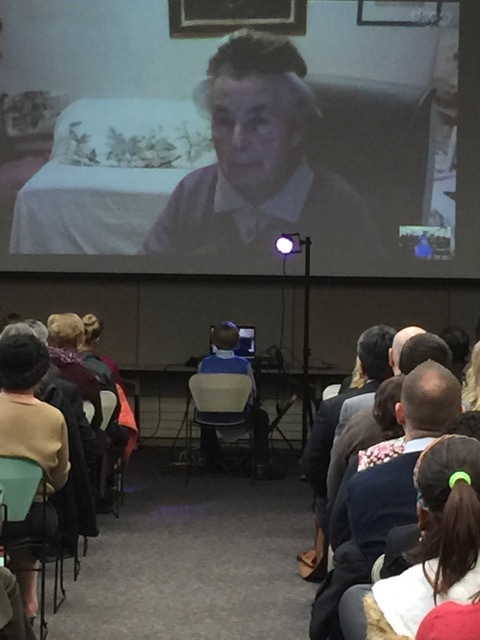 An audience of 200 from the Quad Cities attended a Skype conference with elementary, middle, and high school students and Simone Liebster at Bettendorf Public Library. Also featured were two traveling exhibits: Jehovah's Witnesses: Faith Under Fire and Who Am I? Young Minds orced to Choose.